What if that which you identify with suddenly disappeared? Who would you be then? (IM)PERFEKT is a solo show about identity, beauty and labels. Sometimes you need to (literally) lose a part of yourself in order to discover who you truly are. What if you have been Perfect all along? How much precious time have you wasted living like you aren’t (smart/successful/beautiful/perfect/good….) enough? Actress Jannica Olin was the stereotypical blonde blue eyed Swede. Her long hair had always been a big part of her identity. Until suddenly, she lost it all. 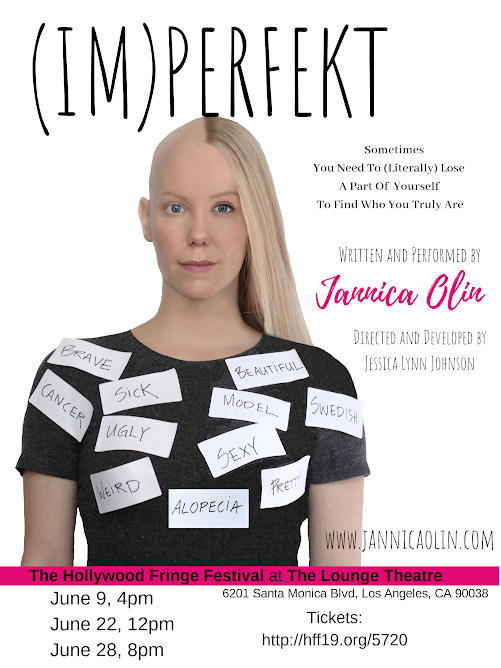 In (IM)PERFEKT, Jannica takes us on a journey of discovering what we aren’t. BECOMING PEACE at Hollywood Fringe! !